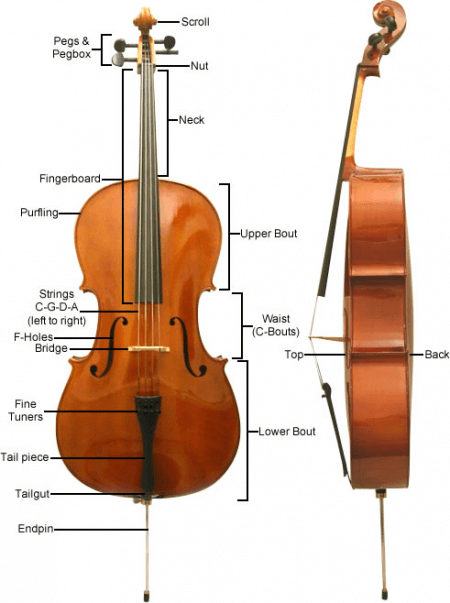 While a cello and a bass violin may look similar from afar and are often made of the same materials, they are not the same. In fact, they are more different than they are the same. It is this article’s objective to lay out the differences between the two. A cello (pronounced chel-oh) is a bowed, four-string musical instrument, and is one of four members of the violin family. Compared to other string instruments, it owns the distinction of sounding closest to the human voice. It is capable of producing a wide range of tones; from low pitches to the higher notes. The strings of a cello are tuned an octave lower than the viola. Along with the violin, viola, and double bass, they form the violin family of musical instruments. The cello is played as a solo musical instrument, in string orchestras, and in chamber music ensembles. It is also played in symphony orchestras as part of the string section and even in a number of rock groups. Eight to twelve cellists usually play both melody and harmony in an orchestra. The cello is played sitting down with the neck of the instrument on the cellist’s left shoulder, the cello’s body resting between the knees, and the lower portion sitting on the ground supported by what is called its spike or endpin. It is played with the left hand pressing down on the strings while the right hand plucks the strings or moves the bow. The double bass, also simply called a bass, is the only modern bowed string instrument tuned in the fourths. Its strings are tuned an octave higher and it is the lowest pitched and largest bowed string instrument in today’s symphony orchestra. The double bass is a standard fixture in the string section of an orchestra or a concert band. It is often featured in solos, chamber music, and concertos. Various music genres such as jazz, country music, folk music, rockabilly, and more have regularly incorporated the double bass in many of their musical pieces. The double bass is about 6 feet (180 centimeters) long from its scroll to its endpin. Several sizes are available to suit a player’s height and hand size. The bass is usually made of a number of wood types; the back is made of maple, the top is made of spruce, and the fingerboard with ebony. A bass is played with the player standing upright behind and slightly to the right of the instrument, which is sitting upright on its endpin. The left hand presses down on the fingerboard on the neck while the right hand plucks the strings or draws a bow across them. 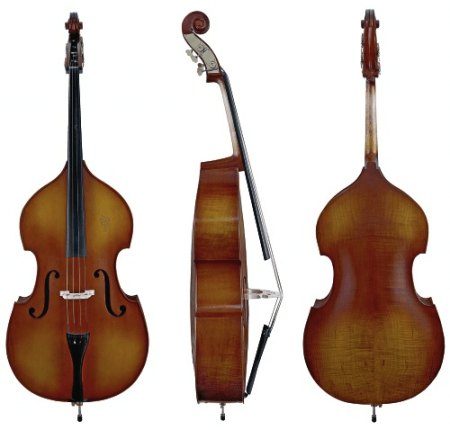 So what’s the difference between a cello and a double bass? A cello, just like the double bass, is a bowed, four-string musical instrument which is famous for sounding closest to the human voice due to its wide range. Its strings are tuned in the fifths and are an octave lower than a viola. A double bass is the only contemporary bowed instrument tuned to the fourths. The cello’s range is about 5 octaves, whereas the double bass has a maximum range of 4 octaves. Also, a cello player sits down while he/she plays while a bass player stands up.